plugged into another Arduino or it can also be plugged into a Raspberry pi. You can run Arduino software on this shield and access the Raspberry Pi that it is plugged into. Its essential function is a Bluetooth hardware module A 4.2 (UART) BLE-Nordic nRF51822 Bluetooth 4.2 module (Single Mode). It can run standalone using the Arduino that is built in. Or you can plug it into a Raspberry Pi and this module can access everything on the Raspberry Pi. The Raspberry Pi can also access all functions on this board. An Arduino library was developed that you can plug into the Arduino Uno IDE. 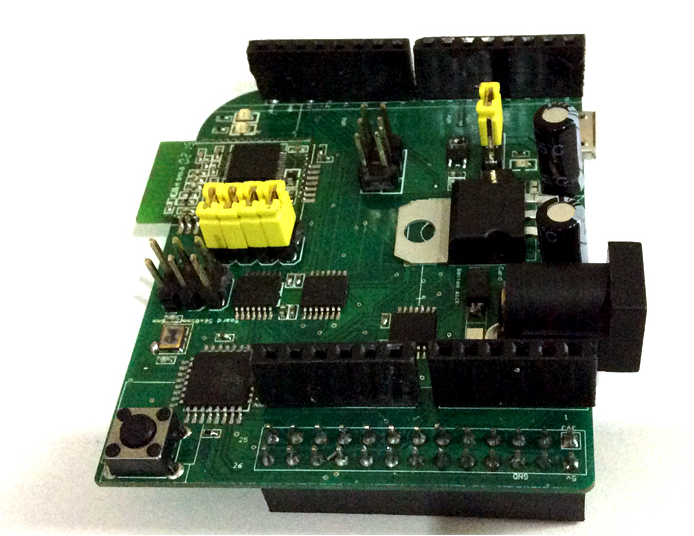 Using this library you can directly access all Arduino and Raspberry Pi I/O peripherals. This allows you to stack many Arduino boards to build really interesting modules that were not possible before. The Arduino can access external sensors and it supports Apple iOS / Android / Raspberry Pi for UART data transmission. This board supports the Bluetooth SIG specification 4.0 and 4.2 specifications. This is a very unique board that we developed in-house that no one else has. We will provide many software examples and we are developing more every day. more information, please see ifroglab web site. true by the Raspberry Pi environment, direct control and edit Arduino uno and BLE control with Smart Phone. This in a dynamic situation, in the direct control of the Raspberry Pi, Arduino update programs, and to obtain information on the Arduino board. Arduino is a huge ecosystem, if Pi can convert Arduino interface standard, it will be able to access a variety of Arduino expansion board Arduino ecosystem access to get more resources available, this is the function of the board. Built-in Bluetooth 4.0 BLE F-60 Uart, connect to iOS and Android . First Release Rx / Tx Uart data transmission. to achieve smart home, industrial automation and business applications, as well as logistics, access control, and cloud services related to large distributed cloud connect heterogeneous network deployment, using Bluetooth wireless technology practice in the service and “articles” between direct communication. Let Raspberry Pi by Arduino Shield connection, Developer GPS, motor control, Lego Arduino shield board and other hardware features. power consumption: automatic sleep mode, standby current of 400uA ~ 1.5mA, transmission 8.5mA. ARBle Shield Uart for Rx / Tx UART data transmission module. ARBle Shield IPv6 for IPv6 features designed modules can be controlled through a web (example program only providing Raspberry Pi and Raspberry Pi 2). This is a movie into this, you can see, the version control ArBle shield your phone can connect and control peripheral appliances, hardware and ArBle shield can be connected to the relay, and via 110V power control, can control the light switch . In this video you can see such a person, ARBle shield to the version, can be directly written on top of Raspberry Pi Arduino programming language.